The Fellowship of Christian Cowboys is a non-profit interdenominational ministry founded in 1973. The FCC is a faith-funded ministry operating solely on the financial support of individuals and companies who share a common desire to present the Good News of Jesus Christ to cowboys and all who enjoy the western lifestyle. The FCC national office is comprised of a small, dedicated staff of unselfish people serving God through the work He has called them to do. The national FCC organization operates under a Board of Directors made up of men and women from various walks of life. Our purpose is to present, to cowboys and all whom they influence, the Good News of Jesus Christ and the adventure of receiving Him as Savior and Lord. 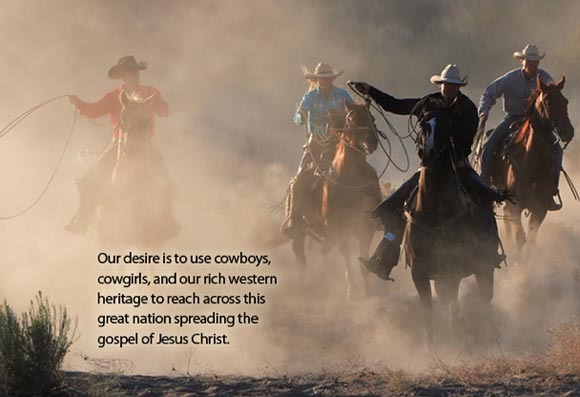 Our vision is to bring cowboys and all those who enjoy the western lifestyle together and to support them in impacting their communities for the Kingdom of God.